Sveiki atvykę į Niujorko Apreiškimo parapijos internetinę svetainę! Welcome to Annunciation-NY parish website! VELYKOS NIUJORKO APREIŠKIMO PARAPIJOJE 2019 M. BALANDŽIO 21 D., 7 VAL. RYTO. DĖMESIO: VELYKŲ RYTĄ 10:00 VAL. ŠV. MIŠIŲ APREIŠKIMO PARAPIJOJE NEBUS. HOLY EASTER MASS AT ANNUNCIATION CHURCH – APRIL 21, 2019 AT 7:00 AM. PLEASE NOTE THAT THERE WILL BE NO 10:00 AM MASS AT ANNUNCIATION ON EASTER SUNDAY. To read what’s new at NY Apreiškimo (NY Annunciation) – click on NEWS. To view NY Apreiškimo (NY Annunciation) events, please go to EVENTS/RENGINIAI and then click in the calendar on the event that interests you to see event details. 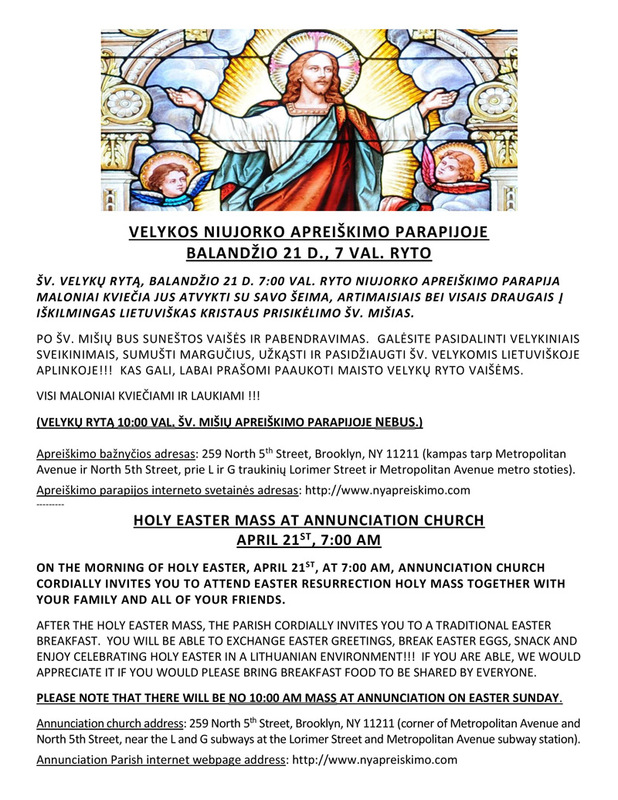 For NY Apreiškimo (NY Annunciation) Parapijos Weekly Bulletin created and edited by Vida Penikienė – click on BIULETENIS. For NY Apreiškimo (NY Annunciation) Parapijos English Language Bulletin Žinios created and edited by Pat Sidas – click on ŽINIOS. 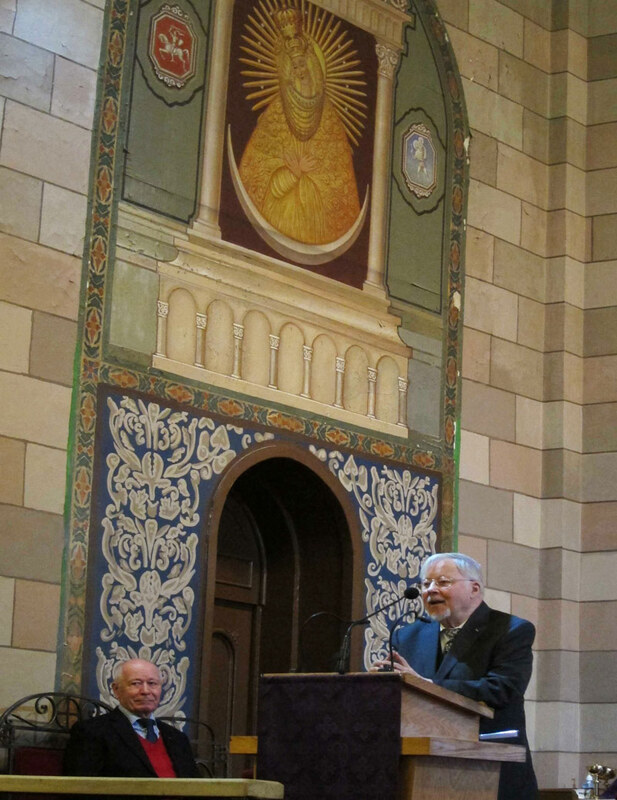 To see photos from NY Apreiškimo (NY Annunciation) events- click on PHOTOS. 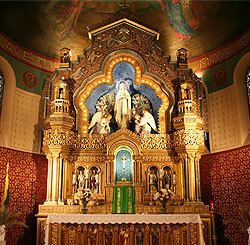 To read about NY Apreiškimo (NY Annunciation) Parish in Lithuanian, click on LIETUVIŠKAI. 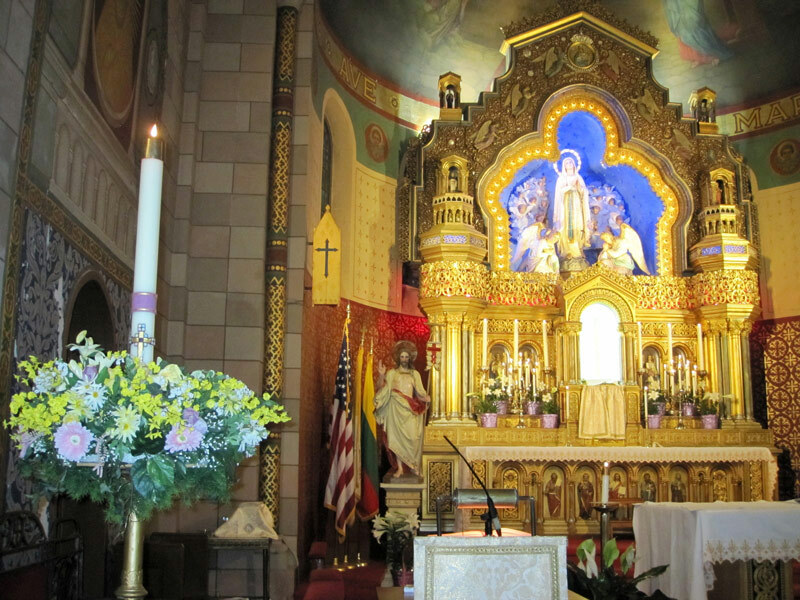 To see information about NY Apreiškimo (NY Annunciation) Parish in Spanish, click on ESPAÑOL. To read NY Apreiškimo (NY Annunciation) Parish history, click on HISTORY. Other News and information … SEE BLOG section. For additional information requests please email here. Below is Apreiškimo address on Google map. You can click on it to get driving directions to our parish church. A parish is a community of believers, part of Christ’s Mystical Body. Pope Pius XII, in a special Constitution, provided for ethnic parishes to meet the spiritual needs of Catholics around the modern world. An ethnic parish, like the parish of The Blessed Virgin Mary of the Annunciation, Brooklyn, New York, unites those of common language and tradition in the movement toward Christ. The existing church, at 259 North 5th Street, was built by German speaking people in the Lombard Romanesque style. The cornerstone bears the date of 1863. Brooklyn Bishop McDonnell suggested that the Lithuanian speaking community buy the rectory, church, and school from the Germans. In 1914 the sale was executed and Annunciation Church’s new life as an ethnic Lithuanian parish began. From the beginning, Annunciation’s parishioners showed their concern for the strengthening of the Catholic faith and for the preservation of Lithuanian culture. Within 10 years the parish became the largest and most active Lithuanian Catholic parish in greater New York, and remains so today. In the wake of WWII, Annunciation became a spiritual and cultural home for hundreds of Lithuanians displaced by the war. The parish is served by two trustees, Vida Jankauskas and Juozas Rudis. Vladas Sidas chairs the Lithuanian Affairs Committee. A committed group of men serve as ushers, who take up and count the collections and help with seating and distribution of programs. Annunciation has a full complement of lectors who read at all the Lithuanian Masses. There are, at present, two altar servers, Simas Chakar-Palubinskas and Matas Šližys. The Kavine Committee prepares the hall and sees to it there is coffee and cake after Mass every Sunday when there is not another even scheduled. The commitment to the Gospel has never wavered at Annunciation, even in the face of the current priest shortage. Mass is said every Sunday, in Lithuanian, at 10:00 am. Rev. Vytautas Volertas, visiting priest from Transfiguration Church in Maspeth, NY, is celebrant, since Annunciation at present does not have any resident priest to serve the parish. Vytautas Cereska serves as Eucharistic Minister. HE Bishop Paulius Baltakis, OFM, regularly celebrates the Christmas Eve, Berneliu Misios, and the Easter Resurrection Mass at Dawn, Prisikelimas. This Easter nearly 300 people attended, many having breakfast in the parish hall afterwards. Annunciation was among the first parishes in the diocese to have a parish council. At the direction of now retired Bishop Dailey, the parish council was absorbed by the Mr. Carmel Pastoral Council. Since the retirement of Rev. V. Palubinskas in 2000, the parish has been administered by the pastor of Mt. Carmel parish, currently Rev. Joseph Fonti. Due to the shortage of priests the 9:00 am English language Mass was suspended in 2006. Some English speaking parishioners come to the 10:00 am Mass, where English Missalettes are available for them. Mass is celebrated in Spanish at 11:30 am by a rotating group of Spanish speaking priests. At present Annunciation School is rented to a private organization that provides special education services to preschool children. The upper floors of the rectory are rented to the Sisters of Mercy who run a home for the handicapped, and the school’s parking lot spaces are rented to local residents. Babies are baptized at Annunciation, weddings celebrated, and, sadly, funerals take place. Each year a parish “retreat” is organized. Priests from Lithuania usually preach the retreat. First communion classes for Lithuanian speaking children are organized, and this year, on May 14, Bishop Baltakis will confirm several Lithuanian speaking candidates, who are preparing for Confirmation under the tutelage of Dr. Milda Palubinskaite. The Sacrament is carried to the sick and shut-ins by Vytautas Cereska. The sick of the parish are regularly remembers with prayers at Mass. Men and women serving in the US Military are recognized on a special bulletin board at the Sacred Heart altar. During the school year, on the first Sunday of the month, Dr. Palubinskaite, assisted by her husband Rani Chakar, conducts a Children’s Liturgy. On the First Sunday of December a workshop is held to teach children and adults how to make traditional straw ornaments, siaudinukai, that are used to decorate one of the trees in the parish hall for Christmas. On Passion Sunday a workshop for children and adults is held to make traditional Lithuanian style “palms”, verbos, for use on Palm Sunday. On Palm Sunday instruction is provided for children of “all ages”, in coloring and decorating traditional Easter eggs, marguciai. This year’s Easter egg decorating even was reported in the lead article in the 2006 Easter issue of The Tablet, the weekly newspaper of the Diocese of Brooklyn. 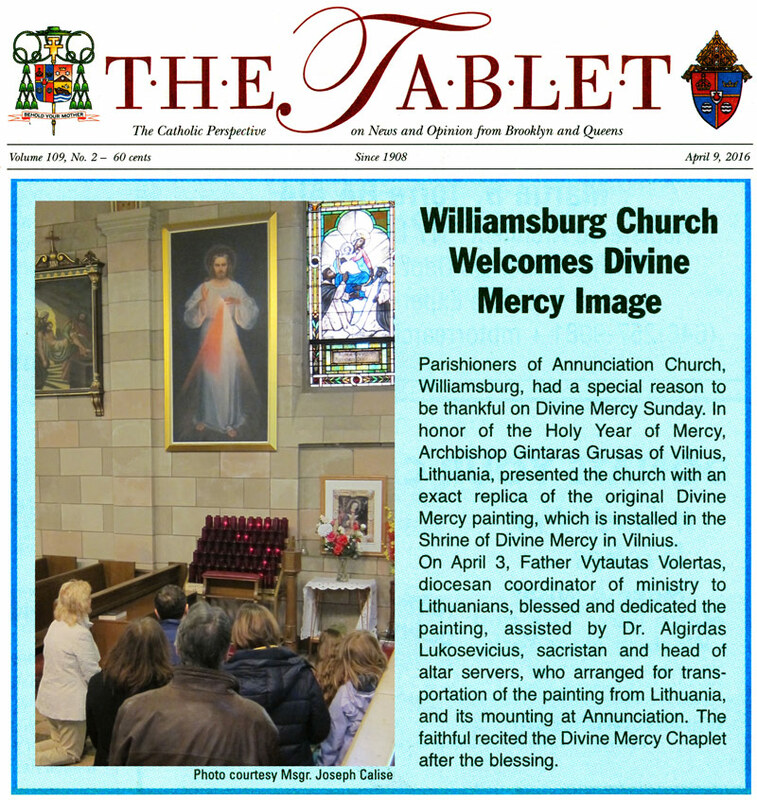 On page 3 the headline was “Lithuanian Easter Egg Tradition lives in Williamsburg” included pictures of parishioners decorating eggs. Parish children, often dressed in national costume, take part in the processions for “Shepherd’s Mass” Christmas Eve, for Palm Sunday, and Easter Sunday. On May 14, 2006, the Maironis Lithuanian Saturday School will again hold it’s Mother’s Day celebration at Annunciation, using the larger hall at neighboring Mr. Carmel as it has outgrown the parish’s hall. Every December, the parish in conjunction with the Lithuanian Scouts Association, and Maironis School sponsors the traditional Christmas Eve meal, Kucios, at the Mt. Carmel Hall. Last year over 200 people took part in this beautiful tradition. Annunciation Parish has a long and distinguished history as a center of musical activity. Today the parish has a 20 member choir, under the direction of Asta Barkauskas, organist and choir director. Ms. Barkauskas is also an accomplished kankles player. The choir sings in 2 and 4 part harmony in Latin as well as in Lithuanian. The parish organ, installed in 1911, is a 2 manual, 35 “rank” Austin Pipe Organ, Opus 288. Vilma Taraskeviciute occasionally assists at the organ. The parish is home to the newly founded New York Lithuanian Choir, under the direction of choral conductor and teacher Gintare Bukauskas. This 23 member chorus rehearses Friday evenings in the parish hall. This year the Choir will sing at the Lithuanian Song Festival, in Chicago, on July 2. The New York Lithuanian Athletic Club (LAK), that last year celebrated 100 years of existence, has returned to its Brooklyn roots and practices table tennis in the parish hall Friday evenings, and basketball at the nearby St. Vincent’s School gym. LAK hosts a Halloween dance every October and a New Year’s Eve dinner dance each year in the parish hall. With the closing of the Lithuanian Cultural Center, Annunciation has once again become the local of organizations’ meetings. The New York District Lithuanian American Community Council, the Brooklyn-Queens LB Chapter, Lithuanian Athletic Club, Tautos Fondas, Lithuanian Scouts Association, Lithuanian Citizens Club are some of the organizations that hold meetings in the Parish Hall. Last year a Lithuanian Theatre group held rehearsals on Saturdays in the parish hall. The coffee hour, kavine, started by the late Petras Sandanavicius, has developed into the Lithuanian speaking community’s regular gathering place. Parishioners and guests drink coffee, visit with friends, hold informal meetings, make announcements, seek and share information about employment, housing, etc. Name days and birthdays are regularly celebrated. Newcomers are welcomed, and guests from Lithuania greeted. Annunciation Parish publishes two bulletins weekly, one in Lithuanian and English, and a second for the Spanish Mass. Modern communications with sometimes far flung parishioners is accomplished through an e-mail newsletter, ZINIOS. 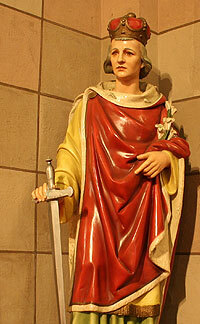 Second photo on this page: Statue of St. Casmir, Patron saint of Lithuania. This statue was rescued from the neighboring Queen of Angels Lithuanian Parish, Brooklyn. 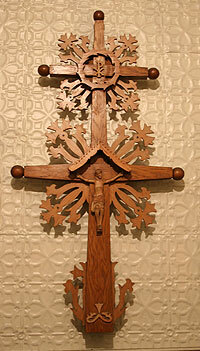 Third photo on this page: Lithuanian Carved Wooden Cross, Sacristy.